Products can be customised by adding eye-catching print or packaging. Product applications, grit grades, barcodes, images and branding can be used to inform potential customers why they should choose your product. 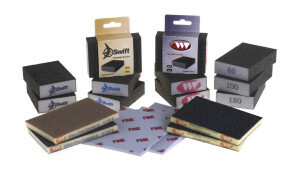 4-sided sanding blocks and 2-sided sanding pads can be printed on the foam edge with your brand logo and grit grade size. 1-sided sanding pads have a large foam face on which branding and grit information can be screen printed. There are many ways in which products can be packaged to improve their visual impact when displayed in a retail environment. Sleeves, display cartons and shrink wrapping are all common forms of retail packaging that we can offer.